Squirting bath toys offer a simple, interactive way to pack big fun into a compact space. With this pack of four ocean animal squirters, you can introduce marine-inspired play and teach your child about sea creatures, all at the same time. Each brightly-coloured bath toy floats, squirts water, and is sized just right for little hands to grasp and squeeze. They're also durable, so you don't have to worry about chipping or breaking. 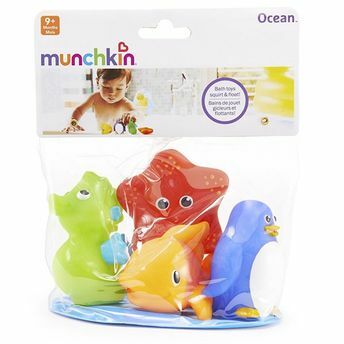 See what adventures unfold when you add these ocean friends to your bath time mix!